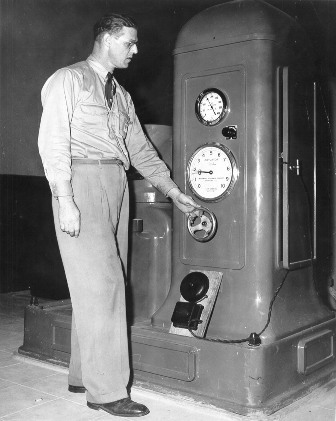 Gordon Byrnell, powerhouse operator for B.C. Electric in 1950. Gordon’s first community service began in Ruskin, as the first president of the Ruskin Community Association, and he also directed several plays for the early Ruskin Players. He was very interested in the historic aspects of Ruskin, and went on to become charter president of the Maple Ridge-Pitt Meadows Historical Society; a position he held for 19 years. Gordon was associated with the Maple Ridge-Pitt Meadows Agricultural Association for several years, serving four terms as president in the early 1960s. He was also an active member of the Maple Ridge Hospital Board of Directors for 13 years, being chairman at the time the new wing was opened. 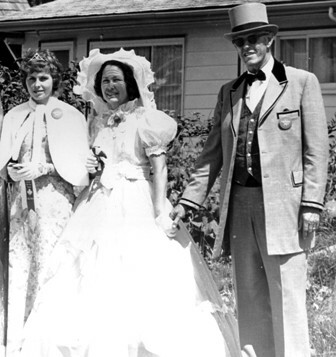 Gordon married Joan Jones on January 2nd 1965, and they made the move from Ruskin to Haney. Gordon served on four Centennial committees; first as chairman in 1958, to commemorate the amalgamation of Vancouver Island and the mainland as a crown colony. In 1966-67, he was program director of the committee which built the arena complex, and was largely responsible for most of the centennial activities of that year, including the opening ceremonies of the complex, when Lieutenant-Governor George Pearkes unveiled the plaque. His third Centennial Committee was in 1971, when the Centennial Arts Centre was built, and in 1974 he chaired the Century ’74 Committee which celebrated the 100th anniversary of Maple Ridge as a municipality. Gordon and Joan Byrnell with one of the 1974 Fall Fair Queens. Gordon worked for B.C. Electric, later B.C. Hydro, for nearly 45 years. Most of that time was spent at the Ruskin and Stave Falls dams, where he retired as a troubleshooting field supervisor in 1972. Gordon had a 28 year perfect attendance record with the Maple Ridge Lions Club, and held all offices within that club, including nine years as secretary, and also served as zone chairman. He always took part in the Lions radio auction, the Mother’s Day pancake breakfast and all other Lions projects. He was also a Mason for about 30 years, acting as an Associate Guardian when his step-daughter, Lily Harper, was Honour Queen. Gordon died in Maple Ridge Hospital in August of 1977.